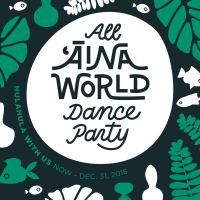 For our 2016 year-end fundraiser, KUA hosted an ALL-ʻĀina WORLD Dance Party in support of this grassroots MOVEMENT. Our goal was to raise $10,000 and get 100 people dancing in celebration of ʻaina momona — abundant lands and waters! Thanks to all of YOU, we doubled down on our previous fundraising effort in 2014 and WOW LAULAU, we actually reached it!!! Long before the Limu Hui was formed and long before many of us were even aware of the need to protect our limu beds, Jerry Leroy Mahilani Kaluhiwa predicted the decline of limu in Kaneʻohe Bay, Oahu. Unlike most people who just sit and complain about the need for somebody to do something, Uncle Jerry stepped up to do something about it. As Ancestral resources dwindle, the children of Kaʻūpūlehu remain steadfast in efforts to mālama (care for) ocean resources.